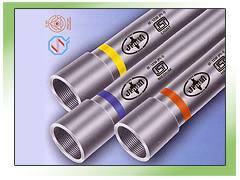 Small diameter steel pipes have different applications in its category. These pipes when used as Welded Pipes need certain characteristics to be controlled during production. The manufacturing process and its raw materials have an impact on the pipes strength, flexibility, finish, straightness, etc besides diameter and wall thickness. When it is required for corrosion protection with Galvanized surface, basic raw material and surface finish is more important. The High Frequency welding adopted for joint along with the right quality of steel used meets most applications when manufactured and tested to different standards intended for such applications.